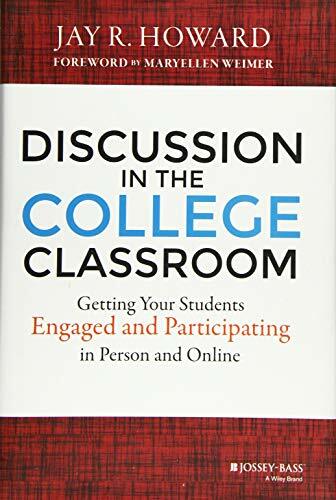 [PDF] Discussion in the College Classroom: Getting Your Students Engaged and Participating in Person and Online | Free eBooks Download - EBOOKEE! Description: Second only to lecture as the most widely used instructional strategy, there's no better method than classroom discussion to actively engage students with course material. Most faculty are not aware that there is an extensive body of research on the topic from which instructors can learn to facilitate exceptional classroom discussion. Discussion in the College Classroom is a practical guide which utilizes that research, frames it sociologically, and offers advice, along with a wide variety of strategies, to help you spark a relevant conversation and steer it toward specific learning goals. Applicable across a spectrum of academic disciplines both online and on campus, these ideas will help you overcome the practical challenges and norms that can undermine discussion, and foster a new atmosphere of collaborative learning and critical thinking. Higher education faculty are increasingly expected to be more intentional and reflective in their pedagogical practice, and this guide shows you how to meet those expectations, improve student outcomes, and tackle the perennial problem of lagging engagement. Thoroughly grounded in the scholarship of teaching and learning, this book gives you concrete guidance on integrating discussion into your courses. You'll learn to: Overcome the challenges that inhibit effective discussion Develop classroom norms that facilitate discussion Keep discussion focused, relevant, and productive Maximize the utility of online student discussions The kind of discussion that improves learning rarely arises spontaneously. Like any pedagogical technique, careful planning and smart strategy are the keys to keeping students focused, engaged, and invested in the conversation. Discussion in the College Classroom helps you keep the discussion applicable to the material at hand while serving learning goals. 2010-10-17The Truth About Getting Your Point Across: ...and Nothing..
No comments for "[PDF] Discussion in the College Classroom: Getting Your Students Engaged and Participating in Person and Online".